Above, some video documentation of the pieces included in Making Mining Networking, the exhibition that Karin and I have going on until September at Duke University. As I posted recently, the augmented reality platform we used to make the interactive components (Metaio) has been sold to Apple and will be going offline at the end of the year. All the more reason to document everything now — but until December 15 you can still try out the pieces yourself, either in person at the exhibition or on your own computer screen with a smart device (see the images here)! The (generative, network-driven) music is from the project “Listen to Wikipedia,” by Hatnote — which seemed a perfect match for the theme of Making Mining Networking! Making Mining Networking went on display on April 20, 2015 at Duke University’s The Edge digital workspace. The show was originally scheduled to run until mid May, but it was extended several times until September 2015. 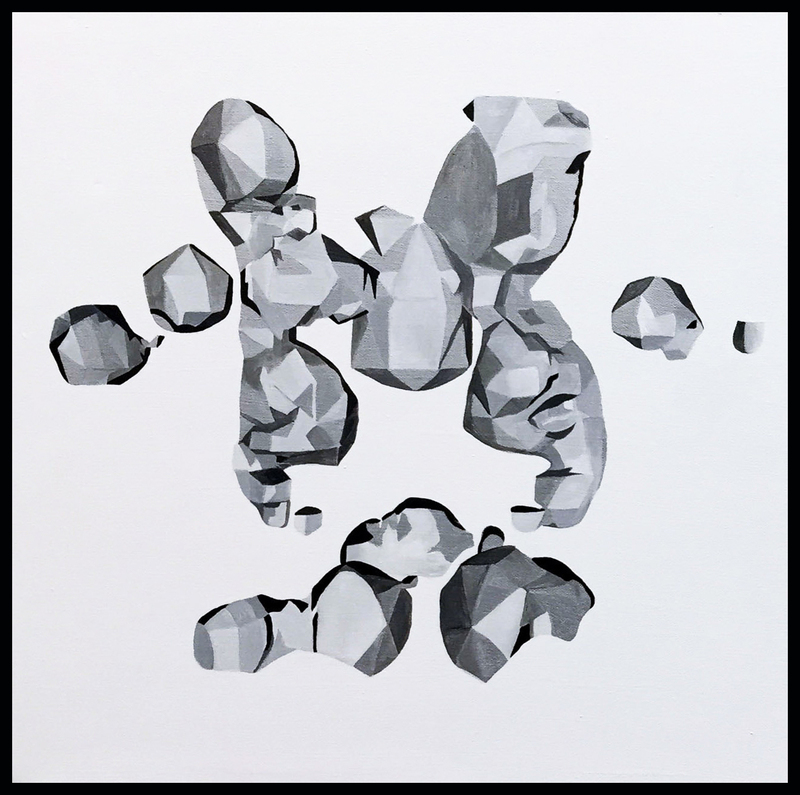 After that, a few of the pieces are slated to be shown in Fall 2015 in an exhibit organized by the online journal Hyperrhiz: New Media Cultures and the Digital Studies Center at Rutgers University Camden. 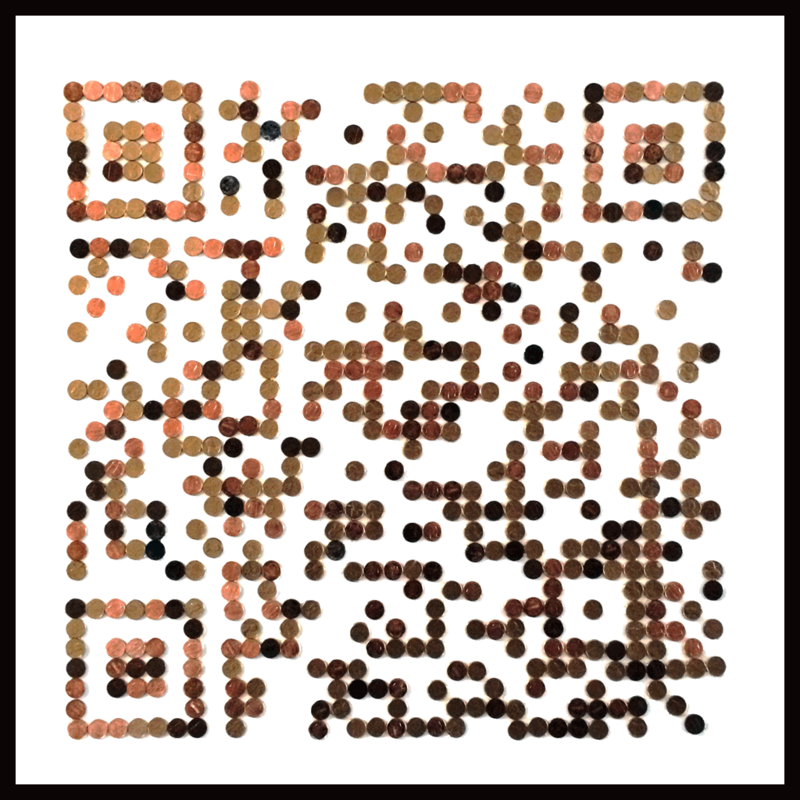 In the meantime, however, it was reported in late May that the augmented reality platform we used to build the interactive components of our pieces had been sold – effectively putting an expiration date on our artworks. Metaio GmbH, makers of the popular Junaio AR browser and the underlying engine that allowed us to augment our QR-based paintings with videos, 3D objects, and HTML hyperlinks, were acquired by one of the biggest corporations in the business: Apple. Metaio products and subscriptions are no longer available for purchase. Downloads of your previous purchases will be available until December 15th, 2015, and active cloud subscriptions will be continued until expiration. Email support will continue until June 30th, 2015. (No, thank you!) Lacking any explanation, users of the Metaio/Junaio AR platform were left to speculate about the future of their advertising campaigns, educational applications, and (as in our case) artworks. Channel publishing to Junaio is no longer available. All existing channels will continue to be available until December 15th, 2015. In other words, the pieces included in Making Mining Networking will no longer be functional at the end of the year. 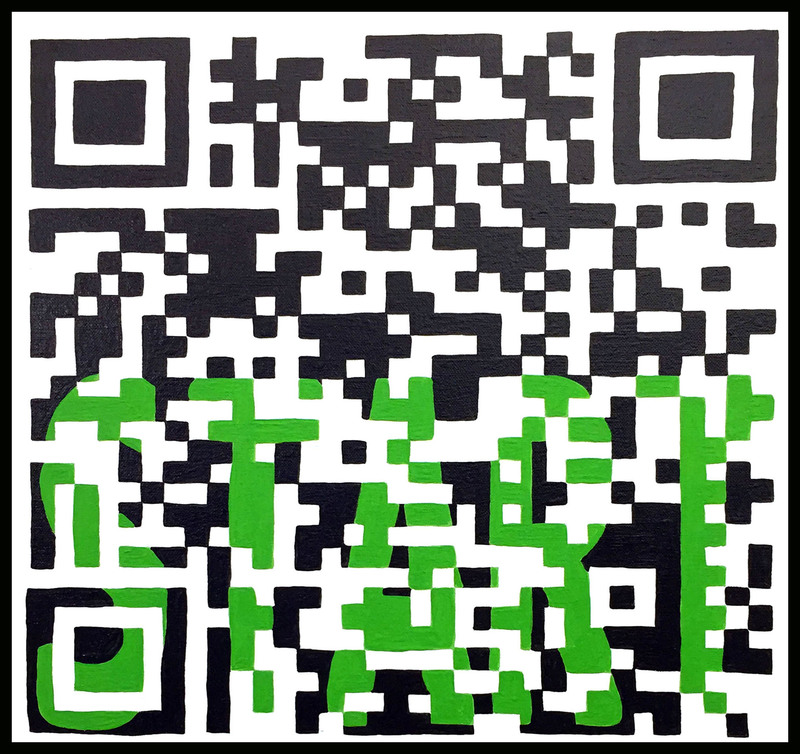 The QR codes painted on these canvases will no longer work; the pieces will then be flattened from the interactive physical/virtual assemblages they were designed to be and rendered into … paintings. Or worse, they will retain an executable dimension, albeit a non-operational one, and it will be supplemented by a weirdly representational dimension: effectively, these will then be paintings of 404 error codes. 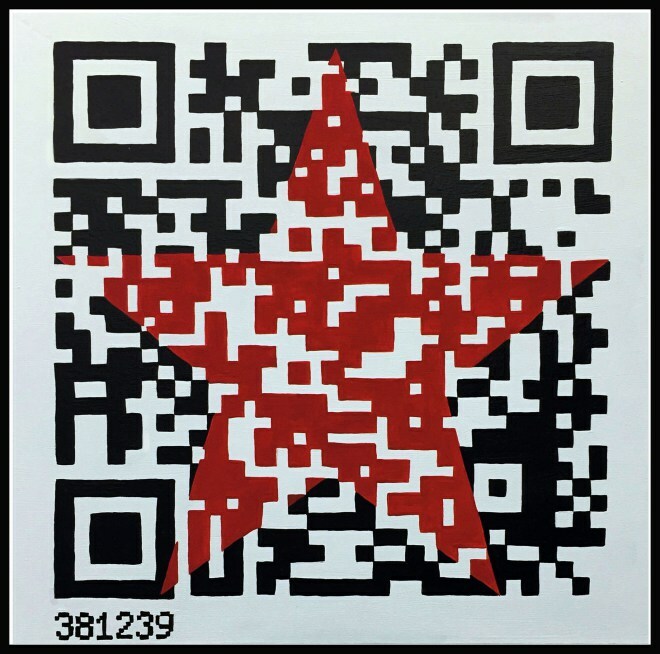 Like all of the pieces, “The Magical Marx-Markov Manifesto Maker” is therefore destined to lose its magic; the QR code, when scanned with a smartphone, will lead the user’s browser into virtual nothingness. On the other hand, though, pieces like “The Gold Standard” and “Gnomecrafting” might still have something to tell us – precisely because their non-operationality will render visible the inevitable entanglement of proprietary platforms and obsolescent objects that is the material heart and soul of digital capital. Making Mining Networking is (or was?) 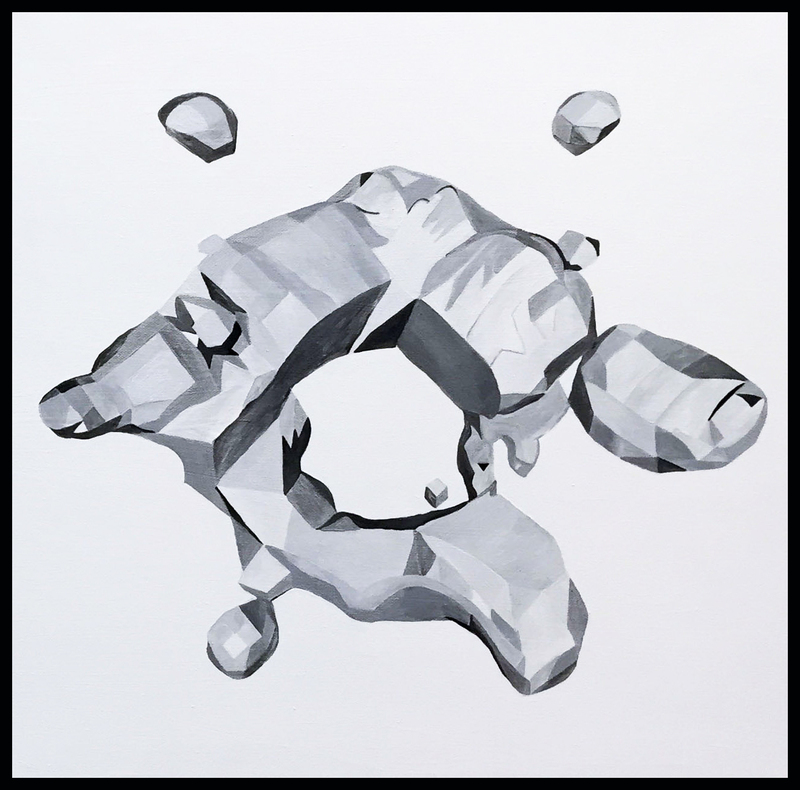 about probing the borders between the virtual and the physical – boundaries that are inscribed in stone (e.g. rare earths) as much as they are written in code. With our works, we have sought to invite users to experiment with this interface, opting for a playful approach to a space that we know is about deadly serious transactions (in the realms of capital and of the environment, to begin with). We installed our data gnomes at the physical/virtual border where they stood as talismans to ward off the bad spirits of digital capital – but we were never so naïve as to believe that they could really protect us for long. We still believe that we regained something of personal value by reclaiming our data from corporate mining and making something weird and inscrutable with it, but now a corporate transaction is about to render our productions invisible. 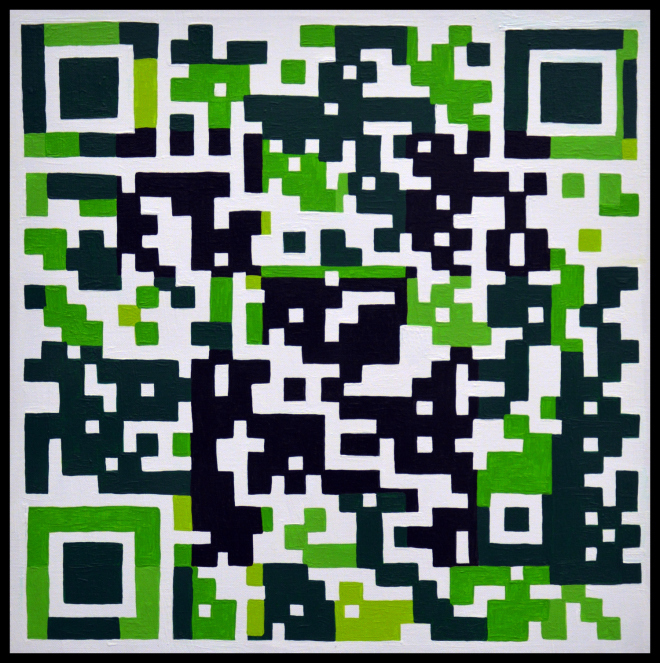 Again, however, it is the seeming totality of such corporate power to make things invisible – to make all that’s solid melt into zeroes and ones – that is paradoxically made visible at this juncture, where links are inoperative, QR codes are non-functional, and paintings are not just paintings but paintings of such failure. 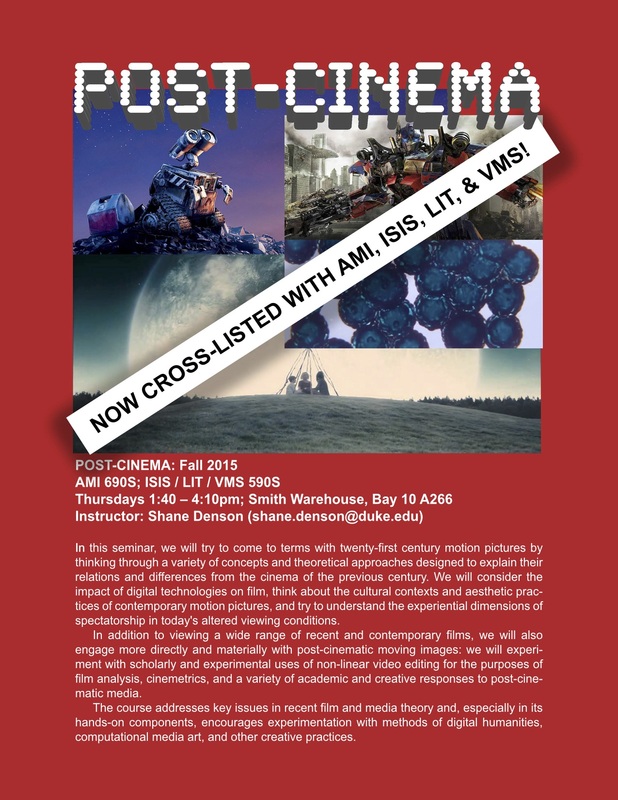 Updated flyer for my Post-Cinema course, now cross-listed with Arts of the Moving Image (AMI 690S), Information Science + Information Studies (ISIS 590S), Literature (LIT 590S), and Visual and Media Studies (VMS 590S). I am excited to be a part of the panel “Video Games’ Extra-Ludic Echoes,” which will be chaired by my colleague David Rambo at the upcoming conference of the Society for Literature, Science, and the Arts (SLSA) — hosted in Houston this year by Rice University, November 12-15, 2015. Below you will find the panel description and links to the individual abstracts. Each of the three presentations in this panel perform their own media-theoretical approach to comprehend how video games extend and consolidate the sociotechnical logics surrounding their conception, production, and reception. We intend to kindle a discussion about the ways certain video games order significant ideologies and activities of human life: from multimedial culture industries to the blurred division between life and labor to the concealment of racism in the techniques of 20th-century entertainment. All three share a motivation to delineate various cultural and economic inheritances of video games and the transformative ways in which video games echo those inheritances. Shane Denson’s contribution attends to the serial manifestations of Batman across genres and media. 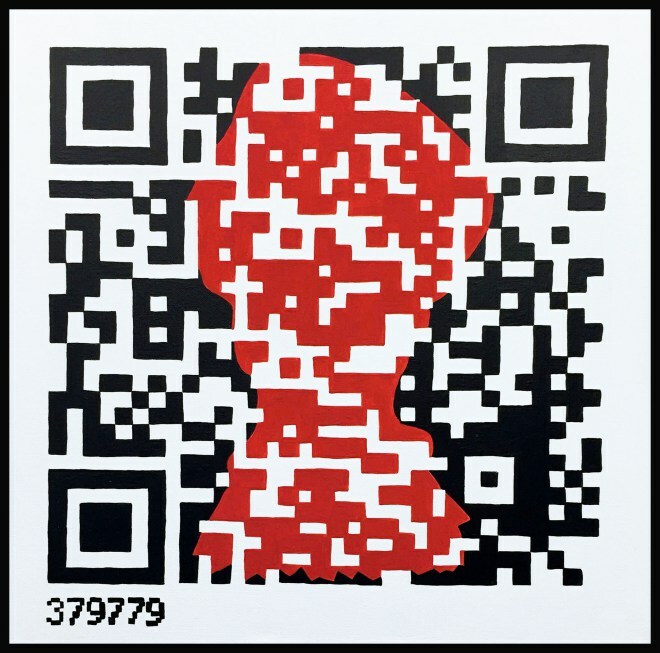 He hones in on the subsumption of life-time under work-time that is common to the computational networks of daily life and to the crossed borders of serial figures such as Batman. In Stephanie Boluk and Patrick LeMieux’s “White Hand, Black Box,” we learn to recognize in the maniculed pointer of various softwares’ interfaces and especially in the Master Hand of Super Smash Brothers the now concealed tradition of black minstrelsy as it was imbued by Disney in the gloved hands of Mickey Mouse and other characters. David Rambo deploys a Spinozist theoretical framework to categorize the video game, Diablo III in particular, as a neoliberal enterprise that extrinsically determines the player’s desire and even will to live. Spinoza’s Ethics thereby offers a way to conceptualize the video game both as an autonomous entity marked with finite, and thus fulfillable, completeness, and as a node in a much broader regime of affections that orders capital’s socioeconomic system. These three presentations depict the video game as an artifactual conduit eminently bound up with the cultural forces that ineluctably structure our civilization, from its marginal groups to its most powerful systemic imperatives. 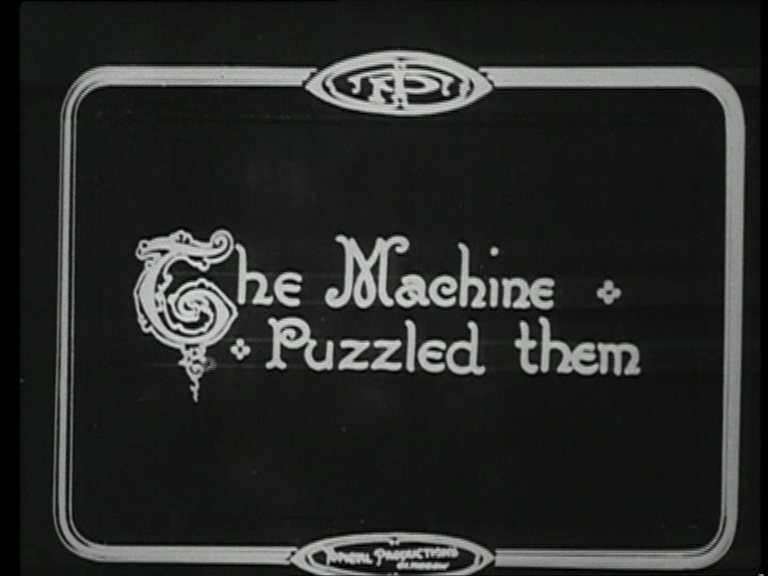 Twentieth-century serial figures like Tarzan, Frankenstein’s monster, or Sherlock Holmes enacted a “parergonal” logic; as plurimedial figures, they continually crossed the boundaries between print, film, radio, and televisual media, slipped in and out of their frames, and showed them – in accordance with a Derridean logic of the parergon – to be reversible. In the twenty-first century, the medial logics of serial figures have been transformed in conjunction with the rise of interactive, networked, and convergent digital media environments. A figure like Batman exemplifies this shift as the transition from a broadly “parergonal” to a specifically “parergodic” logic. The latter term builds upon Espen Aarseth’s notion of “ergodic” gameplay – where ergodics combines the Greek ergon (work) and hodos (path), thus positing nontrivial labor as the aesthetic mode of players’ engagement with games. 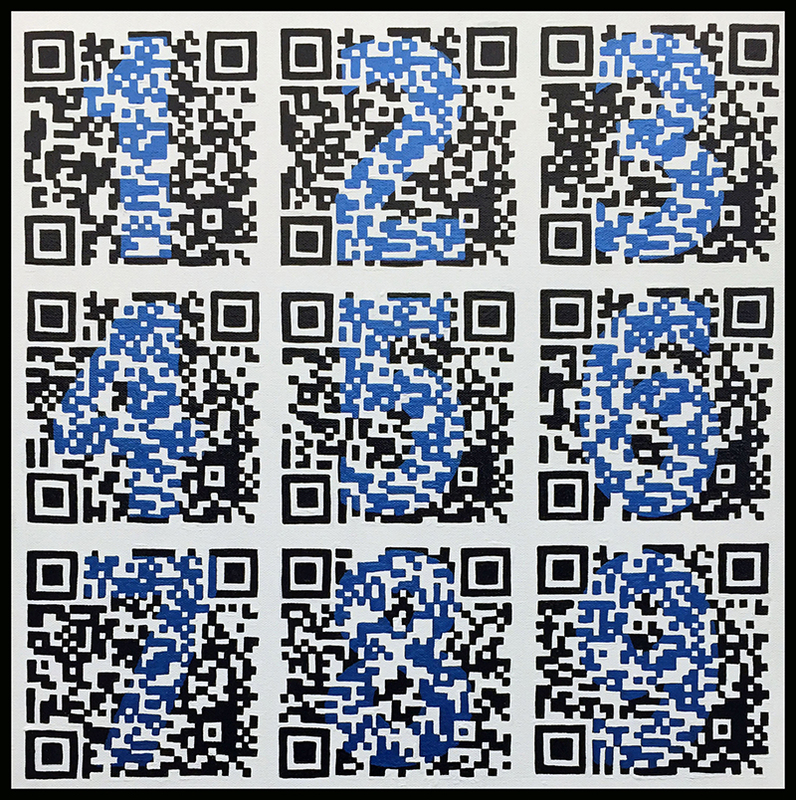 These new, ergodic serial forms and functions, as embodied by a figure like Batman, raise questions about the blurring of relations between work and play, between paid labor and the incidental work culled from our entertainment practices. Following Batman’s transitions from comics to graphic novels, to the films of Tim Burton and Christopher Nolan, and on to the popular and critically acclaimed Arkham series of videogames, I will demonstrate that the dynamics of border-crossing which characterized earlier serial figures has now been re-functionalized in accordance with the ergodic work of navigating computational networks – in accordance, that is, with work and network forms that frame all aspects of contemporary life. Whereas the manicule, a pointing finger directing a reader’s attention, has been used for a millennium in chirographic and print texts, in the context of twentieth century animation and twenty-first century computing the medieval pointer has been recontextualized as the hand of the animator to a graphic user interface (GUI) element. After the popularization of the talkie in the late twenties, in Steamboat Willie (1928), the first ever “Merry Melody” released by Disney, Mickey Mouse adopts gloves and the lilting voice of Al Jolson’s Jazz Singer (1927). This process sanitizes a genre of racist comedy for mainstream consumption. Although Mickey’s gloves are easily deemed merely a contrivance of the technical limitations related to articulating fingers in early animation, Bimbo and Betty, Oswald and Ortensia, Foxy and Roxy, and, of course, Mickey and Minnie are anthropomorphic animals that whitewashed their relation to racist caricatures inspired by blackface minstrelsy. 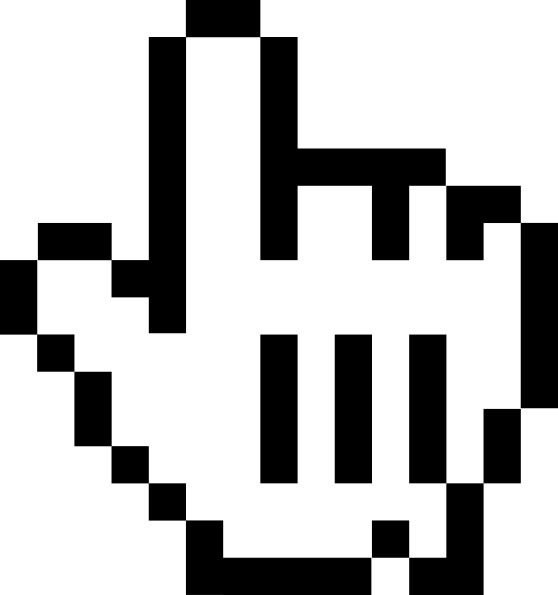 This history was further obfuscated as “Mickey’s manicules” eventually found themselves as elements within the contemporary operating systems like Mac OS and as GUI’s within videogames like Mario Paint in the eighties and nineties. From the metaleptic manicule of classic animations to the metonymic manicule in the GUI, this paper ultimately performs a close reading of the figure of “Master Hand” in Super Smash Bros. (1998) in order to argue that the white hand allegorizes the ways in which “user friendly” design has black boxed the racialized history of computation. This talk extends the Spinozist paradigm for theorizing the medium-specificity of narrative and agency in video games I presented at SLSA 2013. Whereas Spinoza’s first and second orders of knowledge—phenomenal experience and rational systemization—map easily enough onto a single-player video game as a deterministic Natura; knowledge of the third kind would problematically seem to require an idealistic reduction of the video game into an operational and meaning-making Idea in abstraction from culture, political economy, and perhaps even the body of the player. Looking primarily to the changes made to Blizzard’s multiple releases of Diablo 3 (2012-2014), I propose that completion distinguishes the video game from other cultural forms and allows us to conceive of its essence. Pursuit of a game’s completion echoes, in Frédéric Lordon’s Spinozist terms, the ascription of one’s conatus to an enterprise’s regime of affects. For the notion of a game’s completion appears under the purview of the developers’ and industry’s ulterior motives. 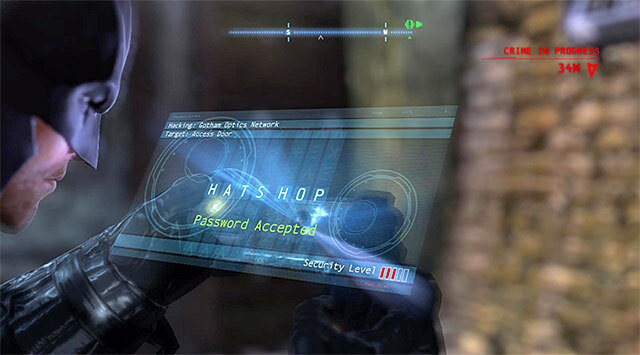 On one hand, the player’s motivation to complete a game redounds to the complex of desires that operate part and parcel with a game’s mechanics, marketing, and historical situation. On the other hand, total completion is a barrier that development studios intend to break by marketing supplemental material, exploiting customer data and feedback, issuing patches, and releasing expansion packs. Spinoza’s ontology of affection allows for a rational ordering of this tension between completion and incompletion in the individual playing and mass market consumption of video games.